While the foundations of this temple go back to late Hellenistic times, the present remains of the upper structure are from the 3rd century AD. Next to it is a cave called the Plutonion from which poisonous gases emerge. (According to Strabo, an ox thrust into this cave would keel over and die. He himself experimented with doves.) The temple measures 20 by 15 m. and sat on a platform that was 2.5 m. high. In front of the temple is a monumental fountain. Built during the late 3rd century AD, the walls of this rectangular fountain are very well preserved. There was once a pool located in front of the fountain and the structure was richly adorned with statues and columns. 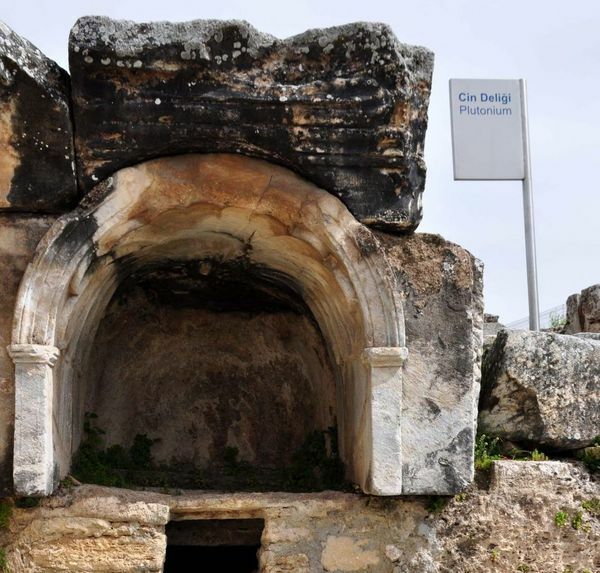 East of the present museum is a Christian basilica consisting of a nave and two aisles. It dates from the 6 century AD. Walking along the route of the Plateia (which now passes through the modem swimming pool and a motel) reminds one that this main street dividing the ancient city was once decorated with colonnades, porticos, and important buildings located on either side. The street runs directly toward the city walls passing through a gateway built in Byzantine times atop an earlier fountain. On the way is a basilical structure with two aisles and a nave whose eastern end terminates in an apse. The city walls were built in 396 AD and were reinforced by twenty-eight towers. Passing through the Byzantine gate we come to a rather well-preserved section of the Plateia. This part was built during the reign of Domitian (81-96 AD) and terminates with the Arch of Domitian. This monumental gateway was actually erected by Julius Frontinus, who was proconsul of the Roman province of Asia in 82 and 83 AD, and it was dedicated to Ute emperor. The gate lias two round towers and three portals. Excavations are now in progress to reveal the remains of shops and houses that once lined both sides of the street. North east of the street between the Byzantine and Domitian gates was the agora of ancient Hierapolis. The traces of the city’s original theater may be seen above. Following the road in the direction of the necropolis one passes by the imposing walls of a building which originally served as baths around the 5th century. The huge necropolis of Hierapolis spreads out on either side of the road for a distance of two kms. It contains tumuli, sarcophagi, and house-shaped tombs that range in date from the late Hellenistic Period to early Christian times. It is one of the most extensive and best preserved ancient cemeteries in Anatolia and a stroll through it leaves a deep, mystical impression upon a visitor, particularly on a moonlit night. The road proceeds onto the hot springs of Karahayit located 4 km. away.